Pearson Homeschool Education makes it easy for you to inspire the joy of learning by tailoring homeschool programs to fit your child’s unique learning style. The award winning curriculum is both affordable and professionally created. The My World Social Studies Series for grades 3 to 6 gets students emotionally involved in learning through stories and discussions that spark creativity and develop literacy skills. In the Connect phase, students are introduced to the big question and watch the video segment. Big questions are a broad-range introduction to the topic and are meant to peak interest before presenting material. Some examples include: "What makes a good community? and "Why do we have government?" For my boys, this part was a definite favorite. We would draw charts on the white board and the boys would yell out one-word answers to add to the chart. Sometimes a word would spark a discussion, like during Chapter 2 when we discussed how people littering is a type of pollution at our local lake. My boys also liked the engaging video segments. The Experience phase contains reading from the student text and reinforcing the information through worksheets. The student book is bright and colorful, with large text. The program I received is intended for third grade and it was a little to much for Isaac to read on his own, as he just finished second grade. James at fifth grade enjoyed it, but it was well below his ability level. Henry (entering 2nd) loved the book, but he didn't attempt to read it himself. I didn't really find anything unique about the worksheets, they were standard and fulfilled the function they were created for. My boys definitely were able to fill them in after reading and watching the video. The worksheets furthered their learning, but they didn't really enjoy them. In addition to the worksheets in the teacher's manual, the student text has questions at the end of each lesson that we did orally. For the Understand portion of the cycle, there are assessments at the end of each chapter. My boys enjoyed these more than the worksheets as they usually contained more discussion-like questions. We like to talk around... writing? No so much! In addition to the Cycle of Learning, the curriculum teaches and reinforces literacy skills throughout the text. You student will be learning to generalize, use cause and effect, sequence, summaries, fact and opinion, main idea and details, compare and contrast, as well as how to draw conclusions. The skills are naturally incorporated into the text and are reinforced throughout. I found this most beneficial because it was done with such ease that the boys thought it was fun and they were easily able to master the concept. Overall I thought My World Social Studies for grade 3 was a nice supplement to our curriculum. It presented topics and skills that our other subjects neglect. It was a fun and interesting program, and the boys enjoyed it. The material learned was new to them and definitely sparked their interest in civics-type learning. Information wasn't just memorized and recited, it was transferred to new experiences. I liked how easily I could teach it to multiple age levels with a few simple modifications. A final note from a teacher perspective: just navigating through the teacher material seemed to be a course in itself. The teacher manual is not lacking in any way; oh no, it is quite the opposite. It is so incredibly full and intensive that at times I felt overwhelmed. I mostly taught from the book and video, using the manual for reproducibles and extension ideas. I liked that there was a video that always showed something different and then we got to read about it in the big book. I didn't like having to write any of the work. The writing part was too much. I thought doing this work was fun, and I especially liked the worksheets because they had to do with the video and they weren't hard for me at all. I liked the video part best because it was fun to watch a video and it showed different things. I didn't like having to do the other work. Well, reading the big book was kind of fun. 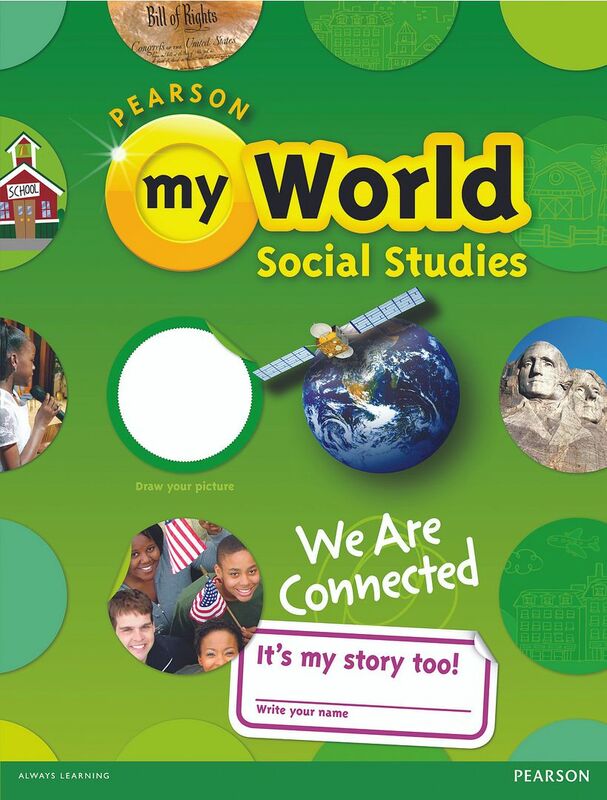 Pearson My World Social Studies for Grade 3 is available on the website for $69.99. In addition to social studies curriculum, Pearson Education offers a wide variety of math, reading, and science programs for grades Pre-K to 12th. Many folks on the Schoolhouse Review Crew are reviewing other products by Pearson Homeschool. Click the banner below to head over and check out their reviews. Disclaimer: As a member of the Schoolhouse Review Crew, I received Pearson My World Social Studies free of charge in exchange for an honest review on this blog. I received no other compensation.